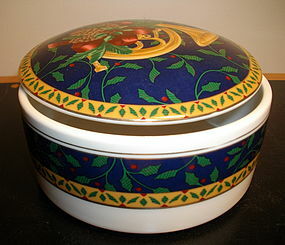 From Mikasa is a lidded box in the Holiday Music pattern. 4 5/8" diameter, about 2 1/4" tall. Very nice condition. 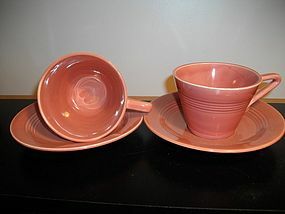 Set of two cups and saucers from Homer Laughlin in Harlequin pattern, rose color. A few teeny flea bites, some manufacturer flaws, otherwise these oldies are in nice condition, made between 1930's & 1950's. This set of dinnerware comes from Termocrisa Glass in Mexico. 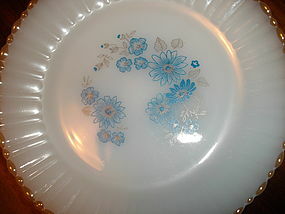 It shows blue florals with a gold luster trim. 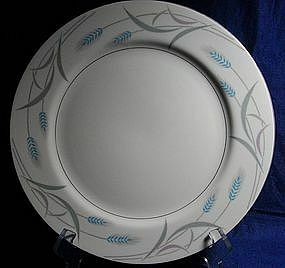 The set includes 4 dinner plates, 3 dessert/bread plates, salad bowl, 6 saucers. 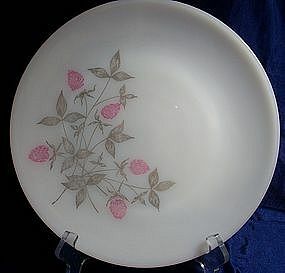 One plate has a small amount of blue discoloration on the luster, otherwise nice condition, no chips or cracks, very minimal wear. 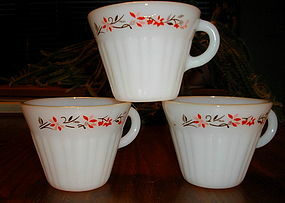 From Termocrisa of Mexico is this set of three red and black floral coffee cups. They are in excellent condition. 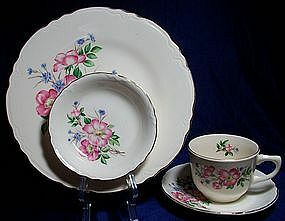 Pope Gosser Florence Dinnerware. Dainty small pink roses with gold trim. 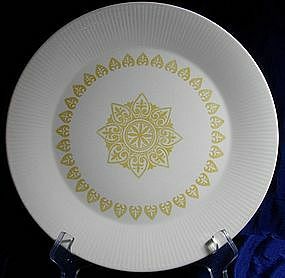 I have 5 saucers available in this pattern. Buy all 5 for $9.99 or make an offer! 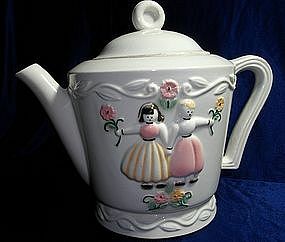 Porcelier China Dutch Boy and Girl Teapot. 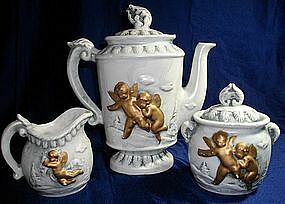 Sold in the late 30's to 1940's as a tea set. This old girl has some chips around the spout end as can be expected and the handle has been repaired quite nicely. There is also a chip on the lid inside and some discoloration in the belly of the pot. Still a fantastic display piece for your collection! 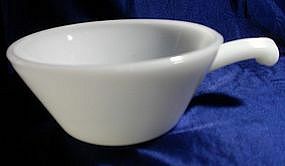 Set of six Anchor Hocking milk white glass bakers bowls, has the handle for easy handling. Use them as soup/cereal bowls too! Not all are marked AH, however they are all identical. Buy all 6 for $12.00 plus shipping. (some have very small chips on the rim, barely noticable). 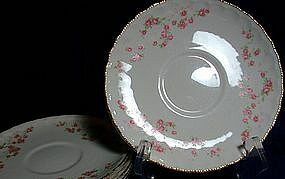 Set of 8 Federal Glass Clover Blossom dinner plates, excellent condition. Buy them by the piece or all for $59.99. A gorgeous teapot set in ceramic, made in Japan. Has gold cherubs over a grey-green landscape background. 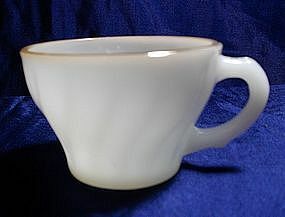 There are various manufacturer flaws, some light paint rubs and a small flake on the rim of the sugar bowl. Manufacturer is unknown. 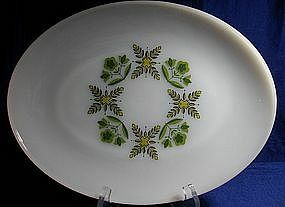 Anchor Hocking Meadow Green Milk Glass Serving Platter, great condition. 12" long oval shape. 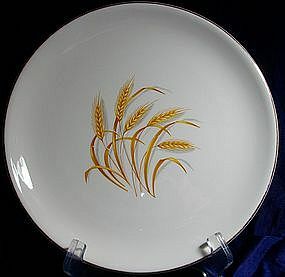 Homer Laughlin's famous Golden Wheat Pattern. This item was given away in products in past days. It is a gorgeous pattern that works well in any country decor. I have the following pieces available: 3 cups 7 plates 8 dessert plates 9 salad plates 5 saucers 7 large soup bowls 2 small berry bowls Please e-mail for complete description and pricing, lets work out a deal! 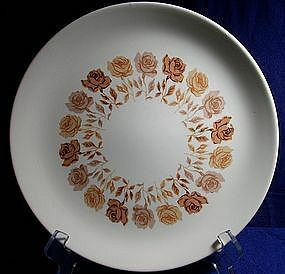 Steubenville Rose Minuet Dinnerware, features a variety of roses in different hues of brown, these pieces have very minimal utensil marks, a very nice set of dinner ware. I have the following pieces available: 1 large serving platter 6 plates 1 vegetable serving bowl 6 cups 1 saucer 6 dessert plates 7 small soup bowls 1 creamer Please e-mail for prices and additional information. We can work out a deal for you! 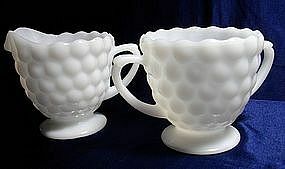 Here is a nice cream and sugar set in AH Bubble pattern, white milk glass, VGC. 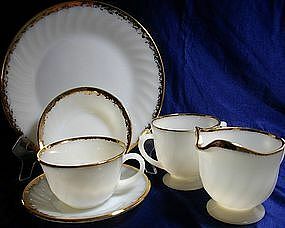 Tiny cups from Anchor Hocking in Suburbia "Swirl" pattern, trimmed on rim in gold, swirl pattern. I'm not sure of the use of these little ones, they are 2 3/4" diameter and 2" hi. Buy one or all, make me an offer! I have 11 in stock, VGC.